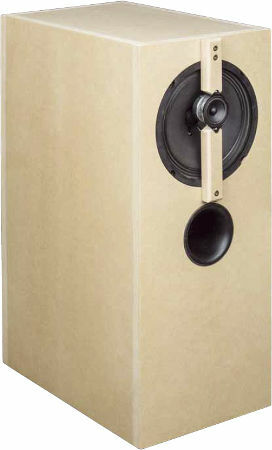 CT273 shelf speaker contains two Visaton fullrange loudspeakers: Visaton BG 20 and Visaton FRS 5 X. It is developed by Holger Barske und Thomas Schmidt. The crossover consists of a 3rd order high-pass filter (18 dB per octave slope) to control the small fullrange speaker. A 2nd order low-pass filter is used for the fullrange Visaton BG 20. In the kit with high end crossover ClarityCap foil capacitors are used. In series to the full range speakers, ClarityCaps of type SA are used elsewhere of type PWA. In series to BG20 is a Mundorf copper foil coil, in parallel to FRS 5X a baked varnish air core coil.